11/12/2013 - TORRANCE, Calif. Honda announced today that a clinical research study of its Walking Assist Device has begun at the Rehabilitation Institute of Chicago (RIC). At RIC, physical therapists and researchers will perform a scientific assessment of the ability of the Honda Walking Assist Device or Stride Management Assist (SMA) to improve the mobility of patients who have experienced a stroke. This will serve as the first large scale clinical research study on the Honda Walking Assist Device to take place in the U.S. The Honda Walking Assist Device is worn outside of clothing and consists of a stylish frame and battery-powered compact motors designed to assist people with reduced walking ability due to injury, illness or other causes. The device was developed by Honda R&D Co., Ltd.
"We are excited about bringing the Honda Walking Assist Device to the Rehabilitation Institute of Chicago for research with the hope of helping adults in America recover from stroke and improve over-ground mobility," said Ryan Harty, manager of the Environmental Business Development Office of American Honda Motor Co., Inc. "As a mobility company, Honda envisions a society where all people can experience the joy and freedom of personal mobility." "The goal of post-stroke rehabilitation is to reintegrate individuals back to their highest level of function for employment, social and community participation. The return of mobility and walking is a crucial part of this return to function," said Arun Jayaraman, PT PhD, of the Department of Physical Medicine & Rehabilitation and Physical Therapy, Northwestern University and the Rehabilitation Institute of Chicago, and Principal Investigator in the clinical research study. 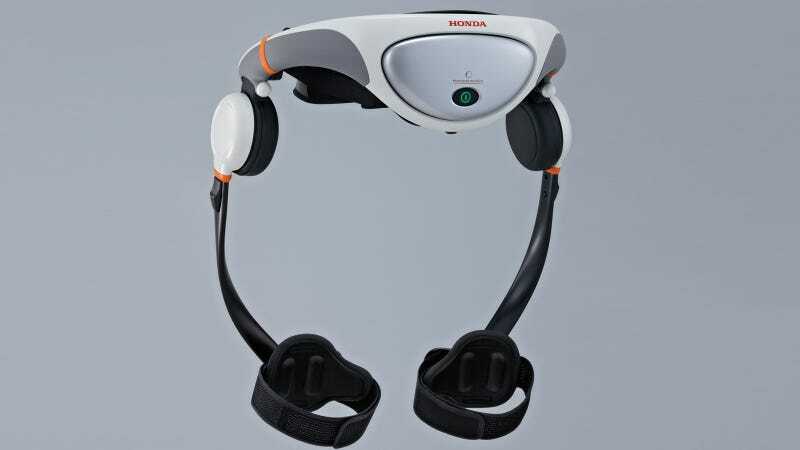 Honda began research and development of the Walking Assist Device in 1999. As with ASIMO, Honda's humanoid robot, the Walking Assist Device adopts cooperative control technologyiv that was developed based on Honda's cumulative study of human walking. The control computer activates motors based on information obtained from hip angle sensors while walking to improve the symmetry of the timing of each leg lifting from the ground and extending forward and backward, and to promote a longer stride for easier walking. The compact design of the device was achieved through the adoption of thin motors and a control system developed by Honda, as well as a simple design with adjustable belts that enables the device to be worn by people of varied body size. "We are committed to leveraging our research into humanoid robotics to improve people's lives," said Harty. From the early stages of the research and development of the Walking Assist Device, Honda has worked with research institutions and other organizations in Japan. Through this process, Honda has received encouraging feedback from patients who underwent walking training, physical therapists, medical doctors, and researchers, all of whom acknowledge certain effectiveness and compatibility of the device in the rehabilitation process. * A total of 9 sets of devices will be tested in the clinical research at RIC. iiC. f. D. Control. (July 2013). Fast-Stats-Cerebrovascular Accident or Stroke. iiiK. J. Sullivan, et al., "Effects of task-specific locomotor and strength training in adults who were ambulatory after stroke: results of the STEPS randomized clinical trial," Phys Ther, vol. 87, pp. 1580-602, Dec 2007.